Samaritan's Purse volunteers present a Bible to homeowners Sasa and Yun in Libertyville, Illinois. Sasa and Yun are among more than 20 families volunteers have helped in the aftermath of devastating flooding. Just as we’re doing in southern Wisconsin, Samaritan’s Purse volunteers are assisting families affected by flooding in northeastern Illinois. Sasa and Yun have been living in their townhome complex in Libertyville, Illinois, for 12 years and praying for ways to cultivate closer friendships with their neighbors. Never in their wildest dreams did they imagine that a flood would become an answer to their prayers and draw them into a tighter-knit community. Volunteer Carol Anno removes waterlogged dry wall. Almost three weeks ago, an already saturated northeastern Illinois was pummeled by multiple waves of thunderstorms over a two-day period, causing flash flooding that damaged businesses and homes. Sasa and Yun’s front doorbell rang about 9 a.m. on the second day, an hour or so after they dropped off their 8-year-old daughter Pingru at summer school. At the door was one of their neighbors, who alerted the couple to flooding in her home. She urged them to check on the condition of their downstairs living space. Sasa and Yun rushed down the half dozen steps. “When we turned on the lights, we discovered the bedroom was in a pool of water several inches deep and spreading to other rooms,” Sasa recalled. Samaritan’s Purse volunteers and Billy Graham Rapid Response Team chaplains pray together before setting out to work and minister. Neighbors soon stopped by to lend a hand. One was the husband of a couple who recently had a baby. He asked if he could help vacuum up the water. Another was a person Sasa had met at a neighborhood board meeting. He brought extra towels to sop up the mess and helped move furniture upstairs. “For 12 years, we’ve been investing in this wonderful community, but we wanted to get closer to our neighbors and just couldn’t figure out how,” Sasa explained. “At one point recently, Yun and I even wondered if God wanted us to move. The couple also thanked God for help from Samaritan’s Purse. Sasa and Yun have the summer off because they work in the local school system as a counselor and a high school physical education teacher respectfully. Dale Eggert and Will Ford remove a cabinet in order to work on the waterlogged wall. But after doing as much work in their home as they could, they were at a standstill. So they sought our help when they learned we were in the area and coming alongside homeowners in Jesus’ Name. They attend The Chapel in Libertyville, our host church. Last week, our volunteers tore out waterlogged walls in several rooms and sprayed and scrubbed for mold. Sasa was also overwhelmed with gratitude. “We felt God’s love through you,” she said, her voice cracking with emotion. 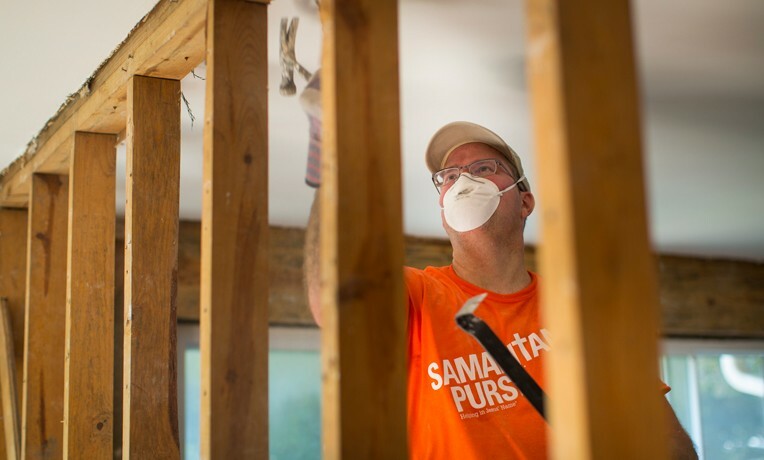 To date, more than 100 Samaritan’s Purse volunteers have helped more than 20 Illinois families in their time of need. We have dozens of work requests to go, so many volunteers are still needed. Through the partnership with our volunteers, staff, and Billy Graham Rapid Response Team chaplains, six people have already prayed to receive Jesus Christ as their Savior. The storm system that ravaged northeastern Illinois also devastated southern Wisconsin. Samaritan’s Purse is active throughout a three-county area there, serving and ministering for God’s glory. Ten people have decided to follow Jesus as a result of this deployment. Not far from where Sasa and Yun live, Samaritan’s Purse volunteers assisted at the home of Sonya Green. Torrents of water busted through a window well and flooded her basement with four feet of murky mess. Over two days, we carried out damaged furniture and other belongings to the curb and ripped out flooring and dry wall up to the ceiling. Homeowner Sonya Green receives a Bible signed by the volunteers who worked on her home. Team member Dale Eggert lives just three blocks away and volunteered during the morning hours.